But when it comes to Special Prices for Business Partners and Period and Volume Discounts, the system applies the discounts to price list and takes the price with an applied amount as a new price to Customer Checkout. For example If a sales item is for sale for 10 dollars, but there’s a 20% discount on Friday, on that day in CCO it shows 8 dollars as a unit price instead of showing it as 10 dollars unit price, 2 dollars discount and 8 dollars gross amount. First of all I want to know the logic behind this, now I think that the reason behind this is to make it easier to add additional discounts when selling an item using Periods and Volume Discount. I think there should exist a cell that shows information about the discount, so the users could track how much discount is being applied to an item. For e.g there’s always a sale on Wednesdays and Fridays in a certain company, so they’re using period and volume discounts to automate this process. As it is now, its impossible for the customer to see that there was a discount on a sales item they purchased. When using Period and Volume Discounts or Special Prices for BP, we would like there to be an additional option to choose whether the discount is applied directly to the price creating a new price, or applied as a discount to the sales item. Do you have any plans in the nearest future regarding this topic? leider wird es dafür kurzfristig keine Lösung geben. Nach Rücksprache mit den Entwickler-Kollegen scheint es nicht möglich über eine B1iF Extension dies abzubilden. Einen Discount in der Kasse kann man auch nicht auf Rechnungspositionen geben nur beim Verkauf von neuen Artikeln. Die Kollegen von der Produktentwicklung haben das Thema auf Ihrer Agenda und für zukünftige Versionen wird geprüft werden, ob eine Umsetzung möglich ist. Einen Zeitpunkt ob und wann hier eine Lösung kommt kann aber zu diesem Zeitpunkt nicht gegeben werden. Rechnungen, Sales-Order etc. 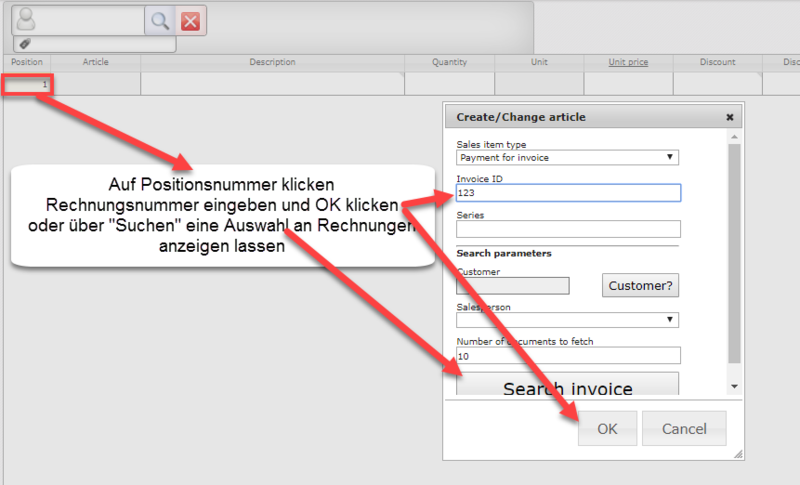 können im SAP Customer Checkout aus dem SAP Business One gezogen werden. Im Verkaufsbildschirm auf die Positionsnummer klicken, dann kommt ein Pop-Up dort kann man entweder die Rechnung suchen, bzw. man kann auch die Rechnungsnummer einscannen. Wenn alles richtig konfiguriert ist, wird de Rechnung gefunden. Zahlungsbedingungen und Skonto wird jedoch nicht übernommen, die Infos die benötigt werden, werden nicht aus SAP Business One geliefert. Eine eigene Kalkulation anhand der Zahlungsbedingungen wird im SAP Customer Checkout nicht passieren. currently the system works as you described above. One reason is to be able to add an additional discount in the line item. Currently the discount percentage taken from periodic discount or special price for BP is not shown in SAP Customer Checkout only the new calculated price. We take the price from synchronized price list and check then if a discount is available. Then the new price is calculated and saved in the price field. The system works as designed, but we had an internal discussion (as we got this question the 2nd time in a short period) and decided to put your idea into our backlog list. Depending on the priority and the decision of the product owner a solution could come in a later release. If there is urgent need you can /evaluate/check if you can adapt the print template with the additional information, they information should be available in the database of SAP Customer Checkout. funktioniert in CCO rechnung aus B1 laden und dann skonto (Zahlungsbedienung) ziehen. Wenn ja dann wie ?